In an interview earlier this month, Bill Murray admitted that the reason he signed on to do Garfield was because he thought he saw Joel Coen's name (Fargo, The Big Lebowski, No Country For Old Men) on the script when it was actually Joel Cohen (Cheaper By The Dozen, Evan Almighty, Daddy Day Camp). Six years down the line I'm wondering what Murray's Ghostbusters co-star Dan Aykroyd will use as an excuse to explain Yogi Bear. Yahoo! 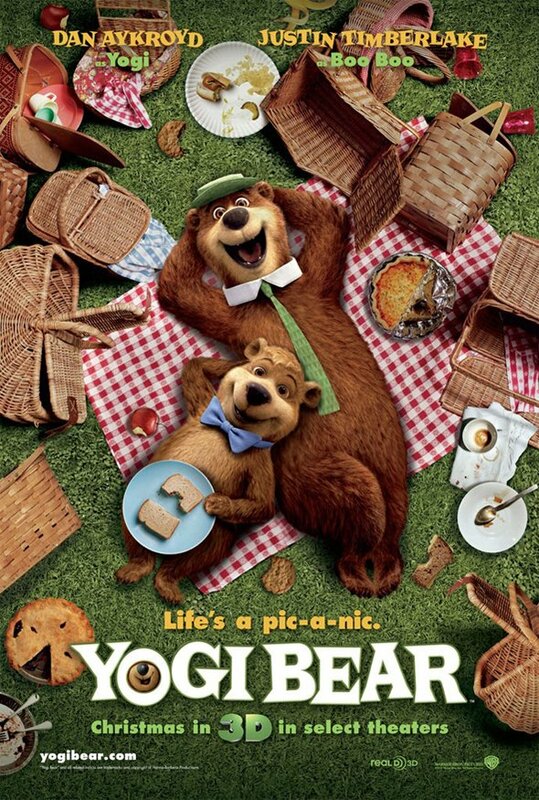 has released the first poster for the adaptation of the classic Hanna-Barbera cartoon, and, if I can make a recommendation, don't stare at Yogi's face for too long. If you do, you start to hear loud, cackling laughter as he steals every positive childhood memory you have of a bear stealing picnic baskets from under the nose of Ranger Smith. It likely won't be too long until we get a trailer for the film, which will probably deliver as many feelings of happiness as last month's Smurfs trailer. And by that I mean none.